From painting pumpkins to the yummy candy and treats, I love all things Halloween. And if you have a FURiend in your life who’s happy to be the centre of attention, even if just for that Instagram photo, then there really is no better reason to have them join in on the fun. While we may be into the last couple of weeks of October, there is still lots of time still time to source the best dog Halloween costumes! I know, I know. Just like all products and services in the pet industry, there is no shortage of choice. But, after getting slightly sidetracked by those photos of cute dogs, I’ve finally settled on 5 of the best dog Halloween costumes to share with you below. Ok.. these are the ones that I laughed out loud at! I’m sure they will be a hit with the FURiend in your life too but if you do prefer to make your own like these fab ghosties, then do check out my Dog Halloween Costume Pinterest Board. Lots of inspiration for that perfect DIY dog Halloween costume! Traditional but cute! I love this skeleton costume from Amazon. In a fantastic range of sizes from small to extra large, your dog will fit right into any Halloween Pawty! With cute hood detail, the skull and bones even glow in the dark. Now it’s even easier for you to spot your pooch in the dark! We all know that our dogs are heroes and make a huge difference to our lives. So why not match their costume to their personality too! I love this cute batman costume from Very.co.uk which is currently available in sizes Small to Large (but selling quickly!). They have a superman version too! Halloween isn’t just about ghouls and ghosts, so why not take your inspiration from famous witches and wizards. Have you ever seen anything cuter than a dog wizard!!?!?!? 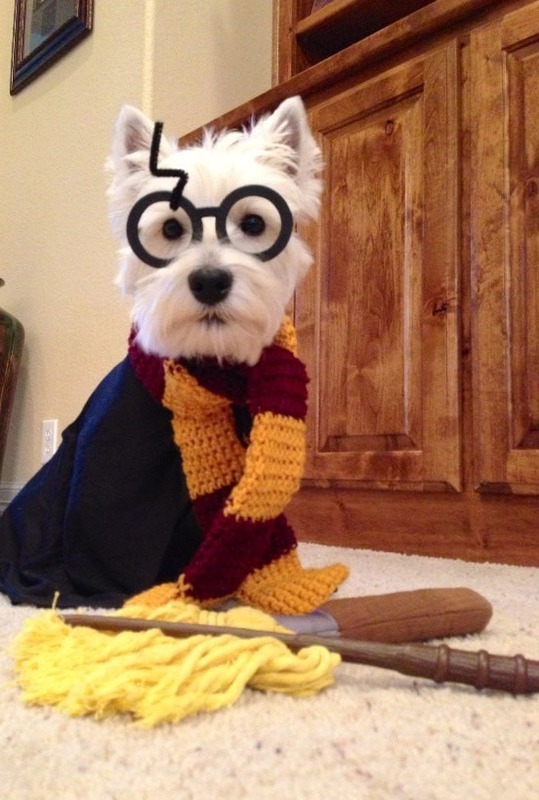 You’ll find lots of harry potter dog accessories online, particularly on Etsy including the fab scarf picture. Add some pipe cleaner glasses and off you go! Sometimes its the simple things that are the best and at just £9 this is great value too! #5 It’s not Halloween without – Pumpkins! It really wouldn’t have been a top 5 without including a good old pumpkin. 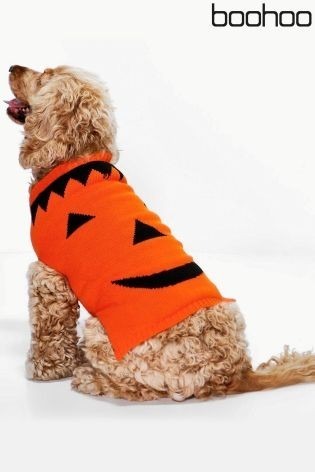 While you’ll find a great range of costumes depicting pumpkins for your dog, this Boohoo jumper, sourced via Next, is great value at £10. Haven’t Found Your Perfect Dog Halloween Costume? If you haven’t yet been inspired, I’ve been busy pinning ideas over on Pinterest. 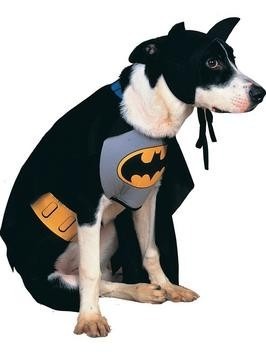 You’ll find a whole board full of doggy Halloween costumes to either make or buy HERE. If you feel a costume is too much then have you considered a bow-tie or bandana to mark the occasion. 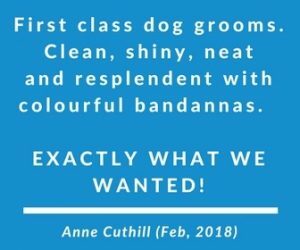 We do have a limited range of tie-on bandanas in the shop but you’ll also find a great range on websites such as Etsy too. 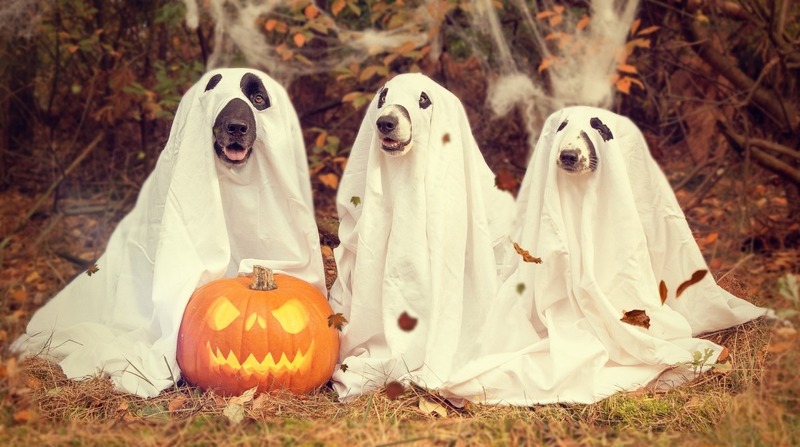 Will you and your FURiend be out trick and treating this Halloween? I’d love to hear about your costumes and feel free to tag us on Instagram @milliespetservices) or pop in to say hi in the shop too! !